Chemical signals are molecules that affect the behavior of those cells that have receptor proteins to receive them. For example, a hormone that binds to a receptor protein affects the metabolism of the cell. Hormones fall into two basic chemical classes. As noted in Table 10.1, most are peptide hormones, a category that includes not only those that are peptides but also proteins, glycoproteins, or modified amino acids. The remainder are steroid hormones, each having the same four-carbon ring complex, but with different side chains. Most peptide hormones bind to a receptor protein in the plasma membrane. This often leads to the conversion of ATP to cyclic AMP (cyclic adenosine monophosphate, abbreviated cAMP) (Fig. 10.14). In cAMP, one phosphate group is attached to the rest of the molecule at two spots. 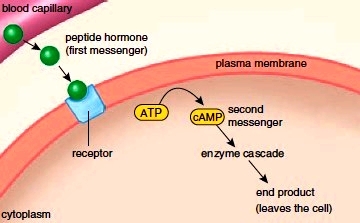 The peptide hormone is called the first messenger, and cAMP is called the second messenger. (Calcium is also a common second messenger, and this helps explain why calcium regulation in the body is so important). Chemical signals that act between individuals are called pheromones. Pheromones are well exemplified in other animals, but they may also be effective between people. Humans produce airborne chemicals from a variety of areas, including the scalp, oral cavity, armpits, genital areas, and feet. For example, the armpit secretions of one woman could possibly affect the menstrual cycle of another woman. Women who live in the same household often have menstrual cycles in synchrony. Also, the cycle length becomes more normal when women with irregular cycles are exposed to extracts of male armpit secretions. The second messenger sets in motion an enzyme cascade, so called because each enzyme in turn activates several others next in line. The binding of a single peptide hormone can result in as much as a thousandfold response. The response can be an end product that leaves the cell. Steroid hormones are lipids, and therefore they cross the plasma membrane and other cellular membranes (Fig. 10.15). Only after they are inside the cell do steroid hormones, such as estrogen and progesterone, bind to receptor proteins. 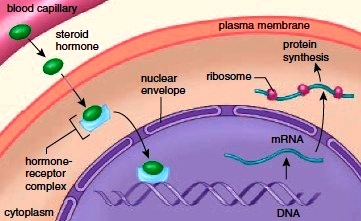 The hormone-receptor complex then binds to DNA, activating particular genes. Activation leads to production of a cellular enzyme in multiple quantities. Cells, organs, and even individuals communicate with one another by using chemical signals. We are most familiar with chemical signals, such as hormones, that are produced by organs some distance from one another in the body. Hormones produced by the anterior pituitary, for example, influence the function of numerous organs throughout the body. Insulin, produced by the pancreas, is transported in blood to the liver and also to all the cells. The nervous system at times utilizes chemical signals that are produced by an organ distant from the one being affected. For example, the hypothalamus produces releasing hormones that travel in a portal system to the anterior pituitary gland. Many chemical signals act locally-that is, from cell to cell. Prostaglandins are local hormones, and certainly neurotransmitter substances released by one neuron affect a neuron nearby. Growth factors, which fall into this category, are very important regulators of cell division. Some growth factors are being used as medicines to promote the production of blood cells in AIDS and cancer patients. When a tumor develops, cell division occurs even when no stimulatory growth factor has been received. And the tumor produces a growth factor called tumor angiogenesis factor, which promotes the formation of capillary networks to service its cells. Figure 10.14 The binding of a peptide hormone leads to cAMP and then to activation of an enzyme cascade. Figure 10.15 A steroid hormone results in a hormonereceptor complex that activates DNA and protein synthesis.